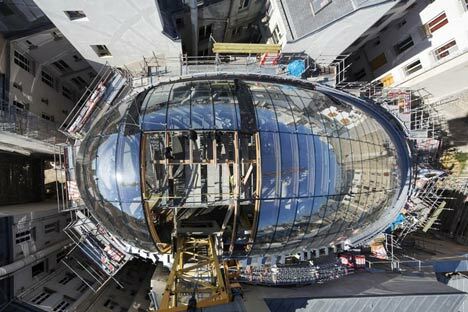 These photographs show the bulbous form of Renzo Piano's almost-complete Fondation Jérôme Seydoux-Pathé, which nestles within a Parisian urban block. The 2,200 m², five-story archive building was designed by the Renzo Piano Building Workshop, an internationally renowned architecture firm that has offices in Paris, New York City, and Genoa, Italy. The Paris-based firm VP & Green Engineering completed the structural design of the project. The long, sloping building reaches a maximum height of 25 m and is located within an 839 m² courtyard in the center of a triangular block of historically important structures. The courtyard was an original element of the block, but its space had been taken by two large buildings. Those buildings were demolished, and the new building and a surrounding garden have been constructed in their place. The curved shape of the new building, which descends belowground along its length, gives the apartment buildings that face the former courtyard better access to light and air without compromising the foundation’s needs, according to material provided by the architects. "The peculiar design of this building is determined by the site's major limits and requirements," said the workshop. "While respecting the distances with the surrounding buildings, the building improves the neighbour's access to natural light and air." 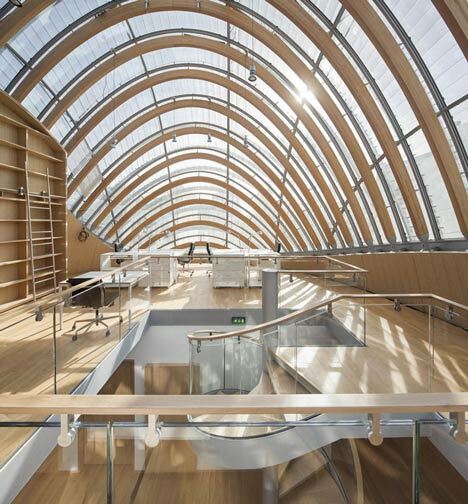 Arching engineered timber ribs guide and support the layer of curved glass panes that form the shape of the building. 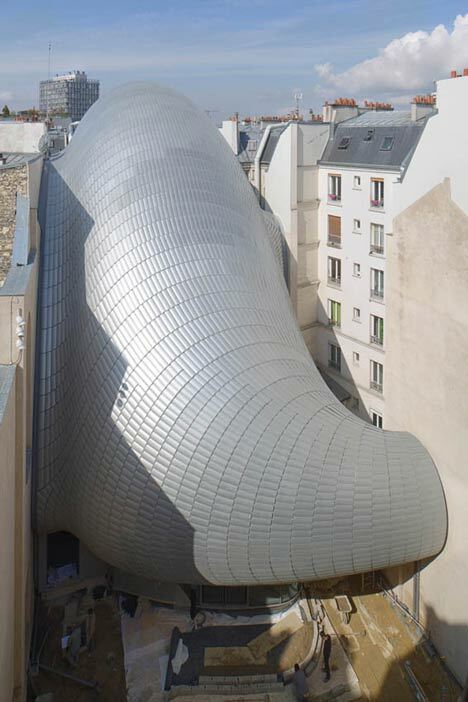 An external skin of translucent glass tiles envelops the entire structure, creating the effect of an armadillo hide over the humped form while letting softened light into the upper storeys.